An MP who was orphaned at the age of 27 has called for people to be able to opt out of Mother's Day marketing emails. Conservative Matt Warman said promotional material could act as a "trigger" for grief and "a reminder of what you have lost". He suggested the advertising watchdog could implement a voluntary code for marketers. Health Minister Jackie Doyle-Price said firms should show sensitivity when contacting people. Speaking in the Commons, Mr Warman said many people did not feel the "true loss" of a loved one until months or even years after their death. 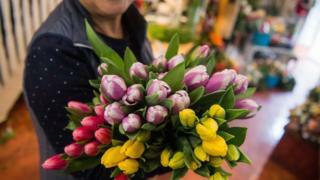 The Lincolnshire MP said companies should follow the example of an online florist which recently said it would allow customers to opt out of Mother's Day marketing. "If other companies were to follow suit, then the dread, and I do mean the dread, around this day might be mitigated for many people," he said. "I could be a part of something that an organisation like the Advertising Standards Authority could make part of a voluntary code around data. "I'm not a Tory asking for some enormous nanny state, but I'm saying another tick box when you sign up for yet more emails would be kind." In response, Health Minister Jackie Doyle-Price said the Advertising Standards Authority "can do a lot more to spread good practice". She added that she would encourage companies to be "a lot more sensitive" in how they contact customers at delicate times. "It's just good behaviour and it's good corporate social responsibility," she told MPs.